If the past two games have proven anything, it’s that defense is far more vital to the Miami Heat’s success than rebounding. Against Golden State: Lost rebounding battle 52-51, but forced 21 turnovers and 36 percent shooting by the Warriors. Against L.A. Lakers: Lost rebounding battle 42-35, but forced 20 turnovers and 43 percent shooting by the Lakers. Both wins. The win against Golden State coming in arguably the Heat’s finest defensive performance of the season and the win against the Lakers coming as more of a struggle due to the lack of support from everyone not named LeBron or Dwyane. When the buzzer sounded to conclude the end of the 2012 NBA Finals, there was only one thought that crossed everybody’s mind. An NBA championship represents the accomplishment and success of an entire franchise coming together, recognizing their potential and abilities, and then properly executing through team chemistry, a readiness to make adjustments, and the physical and mental endurance that comes with having to face a form of adversity. The Miami Heat were the ideal championship team. Their roster didn’t resemble such, but their identity as a hungry, motivated team was what propelled them to defeating an upstart Oklahoma City team in five games, three of which came down to the wire and were decided in the final minute. The team that wanted it more and made the proper coaching and personnel decisions ended up winning. Miami Heat: Is there Any Team Worth Worrying about In the East? The Miami Heat haven’t appeared this mortal since the Big Three joined up nearly three long years ago. A number of complaints and concerns have surfaced around the Heat organization in the first few months of the season, despite the Heat’s 24-11 start being one of the best in franchise history. Among those complaints include the obvious rebounding issue (the Heat are currently ranked 29th in total rebounds per), the new-found defensive issues that didn’t exist the previous two years (Ray Allen and his lateral movement is being blamed for the team giving up 97 points per game), and the ineptitude of the role players on certain nights, specifically Mario Chalmers. The rebounding against Minnesota was pitiful. The rebounding against Orlando was horrendous. The rebounding against Chicago? Well, that was bad, too. 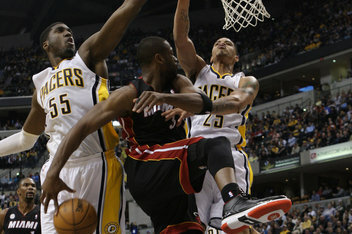 But the rebounding against the Indiana Pacers in the Miami Heat’s 87-77 loss was, well, disheartening to say the least. The Pacers beat the Heat on the boards 55-36, yet that wasn’t even the worst numbers of the night. No, that would belong to the offensive rebounding margin, which was won by the Pacers by a–brace yourselves–22-7 margin.